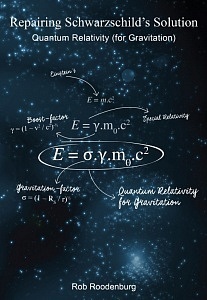 The wonderful world of Einstein’s Special and General Relativity. no more paradoxes, black holes don’t have an event horizon, and there is no need for “dark energy” in the universe. Many authorities, even at universities, with all due respect, copy each other and don’t check their sources for errors. A lack of knowledge of Einstein’s Relativity? Critical sounds are rare and often not listened to. For example, Emmy Noether’s well-founded criticism (a century ago) on Einstein’s Relativity was simply ignored. Till today. Want to see them virtually talking to each other? Check here to the video ! 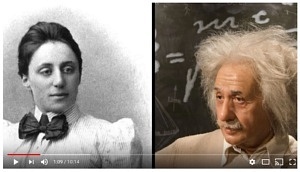 At first, her questioning doesn’t seem dangerous to him, but soon Einstein admits that his theory doesn’t hold for strong gravitation. Edwin Shapiro would prove, 50 years later, that Emmy was right. When you do the checks as we did and then repair Einstein’s Relativity for Noether’s theorem, you get an improved Relativity in which energy and momentum conservation are guaranteed! We hope you get as many “aha” experiences as we did after fifteen years of research. 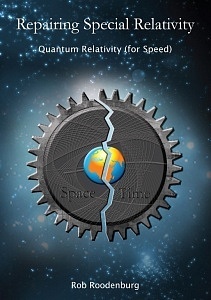 Here we offer you our books: real scientific study material. You can download the first chapters for free to get a first impression of the full story. Well, you may prefer to start with some articles to make the study material more accessible. The Articles concentrate each on a particular subject. More are found under the menu-tab: Articles. We hope you appreciate them and return us your comments. Emmy Noether (1882 – 1935) was a brilliant mathematician, creating one of the pillars of physics: defining reference frames within which energy and momentum conservation can be proven. However, she was at the wrong place at the wrong time. Albert Einstein (1879 – 1955) was a pioneer of space-time. In 1905, he published his theory of Special Relativity, based on the Lorentz transformation. However, he changed his mind more often than is generally known, leaving paradoxes in his theory of Special Relativity when he changed from the Lorentz transformation to the differential Minkowski formula. He also ignored Noether’s theorem, leaving small errors in the Schwarzschild and Robertson-Walker Solutions. 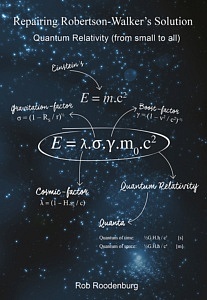 In his theory of General Relativity, Einstein replaced the Lorentz transformation by the Minkowski formula. By interpreting time as Karl Schwarzschild did, and using Noether’s theorem with a constant speed of light, we get the Shapiro solution. The relativity principle then leads us to our repaired Schwarzschild Solution, which is simpler and more elegant, with interesting consequences.